Miss Berry expresses her delight at the fact that Miss Hall enjoyed the candy and did not send it to Mr. Sloane. She also apologizes for the mistake of sending the letter to Mr. Sloane initially. 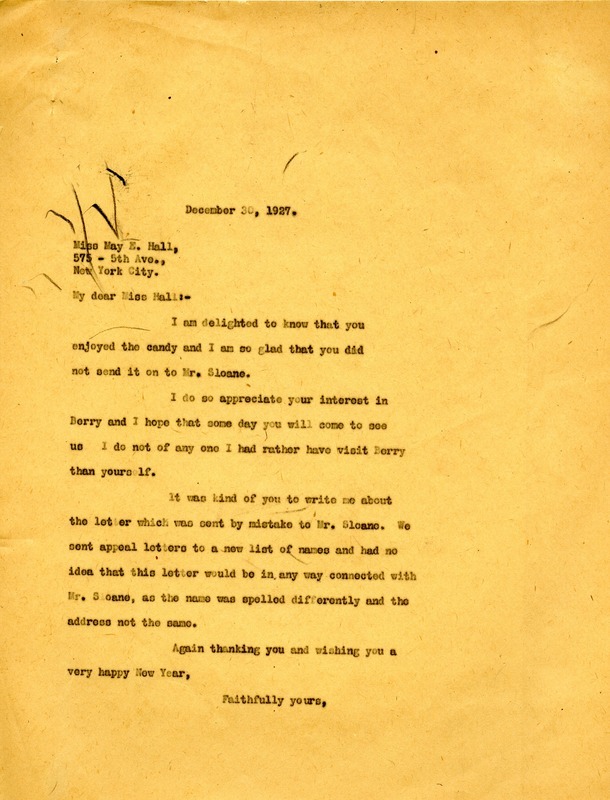 Martha Berry, “Letter to May E. Hall from Martha Berry.” Martha Berry Digital Archive. Eds. Schlitz, Stephanie A., Olivia Mund, Meg Ratliff, et al. Mount Berry: Berry College, 2012. accessed April 22, 2019, https://mbda.berry.edu/items/show/3954.